Welcome back! This was a bit larger break than I intended to take, but the weekend was BUSY! Continuing from where we left off, let’s talk about song 2 on my list of five songs that have influenced my life. Of course, I feel now like it should be Song 2 by Blur, which ps I love, but it’s not. And that right there, that parenthetical, is partly what this is all about. I have a pride and allegiance to my school that is part of my fiber. The Michigan experience creates a common bond, a community, a family of literally hundreds of thousands of people around the world. If I see someone wearing a Michigan anything, I know I can walk up to that person and say, ‘’Go Blue!’’’ and those two words will be an instant icebreaker. And I have, many times. In the grocery store. In airports. And it never fails – connection established. I know everyone feels like a misfit in high school, that she doesn’t quite fit in, but for me it was true. (You were probably popular, admit it.) It wasn’t that I had a bad experience; I had friends and fun. But I was kind of a nerdy bookworm, and remember those liberal hippie parents of mine rubbing off on me? Some of that didn’t really jibe with my peers. Plus I was one of only two Jewish kids in the school – just a lot of not really being like everybody else. When I got to U of M, I felt like I had finally found my people. People who got my sense of humor. People who shared my values. People who helped expose me to new things. It’s not that everyone at U of M is the same – that’s ridiculous – but I had finally found people who spoke my language and understood me, who were open-minded and inclusive. There was diversity galore – it was very, very, very different than what I’d known up to that point, and it was what I’d been looking for. my parents went to Michigan, but weren’t not superfans (although they try now, for my sake, and my dad loves to watch hoops). I developed a passion for college sports. 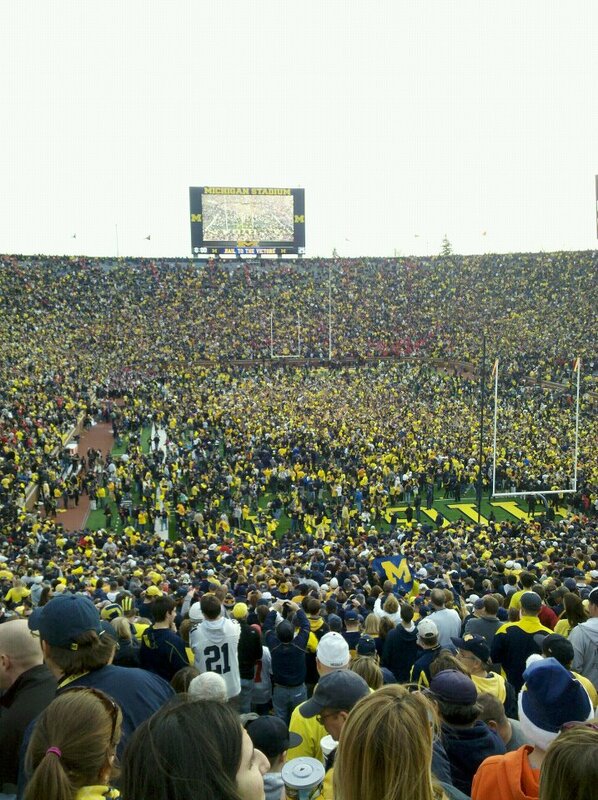 There is nothing like being in the Big House with 100,000 (+) of your best friends on a crisp fall afternoon. When the band high-steps out of the tunnel and onto the field (‘’Band…..take the field!’’ Rum pum pum pum pum pum pum pum!) to the driving drum cadence and they line up to play the fight song, it is thrilling. Sometimes, as we go all Pavlov’s dogs and begin to clap and pump our fists in unison, I feel like maybe I joined a cult, but it’s a really, really awesome cult. I know this is not necessarily unique, what I’m describing. But it was special for me, and still is. I’m proud to be a Michigan Wolverine, and Ann Arbor is maybe my favorite place to pass time. And who doesn’t love marching band music? So here you go, enjoy! OMG. Was searching on YouTube for a good clip of the band in the stadium (to no avail) but now I am trying to refrain from sharing with you all these other amazing Michigan moments….that’s not why you’re here….ok, maybe just this. Come on, it gives me goosebumps every time! THIS IS MICHIGAN! A very good post on W.